It’s so easy to take safety for granted. We may wonder at why, like what was in the news last year, a fellow gets burned after an explosion in his work shed. It turned out he was smoking or had a lit cigarette and there was an open can of petrol, and you guessed it, the darn thing blew up! Let’s face it, from moving parts to flammable fluids, petrol engines contain a number of materials that can harm a user who’s not cautious. Some safety ideas may seem simple enough, but sometimes a little reminder can go a long way when the focus is on the job and safety measures are unintentionally neglected. By noting and taking care of observing the following tips you can help prevent any accidents or injuries that could occur. Some safety measures are generally common sense. As we’ve learned, it’s best not to light up a cigarette while working on anything that involves fuel. Before cleaning the fuel cup or replacing a fuel hose, ensure the area is free of flames, sparks and anything that may be prone to igniting. Follow the same guideline when draining fuel from the engine before storing the equipment. The vapour from one just 250 ml of petrol, when mixed with air in the right proportion, will have the explosive power of about several sticks of dynamite. Scary, huh? But, it’s true and worth noting. Remember that it is fuel vapour that is extremely flammable. Clean up any fuel spills immediately, and discard the rags in a closed metal container. 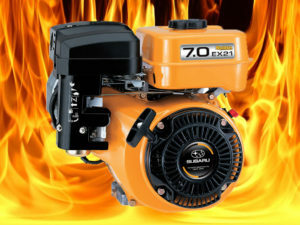 Carburettor cleaners and engine degreasers, along with the vapours, are also flammable and should be treated with that same care. We should also remember to store fuel only in approved containers. This will prevent vapours and flames. 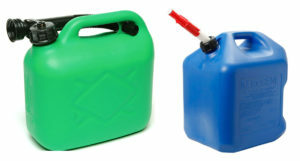 Kerosene cans are constructed differently than petrol cans and should never be substituted, nor should other storage containers, such as glass or plastic bottles. No matter what the container, never store fuel near an area with an open flame, such as an oil heater.